It is just too hot here to cook much unless you wait until after 9 pm for dinner. So I prepared the bacon in the microwave and we had a favorite of ours, a Bacon, Lettuce and Tomato sandwich. Since my herbs are growing so well, I just hate to miss an opportunity to use them, so I added a layer of fresh basil leaves to the BLT and OH MY...was it good. Toast the bread. Butter each piece of toast and then add some mayonnaise. Salt and pepper tomato slices. On the toast layer whole basil leaves, bacon, tomato, lettuce and then the final piece of toast. 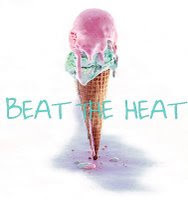 I am entering my BBLT in the "Beat the Heat" blog event hosted by Grace of Southern Grace! Don't you just love this theme!!! and Oh My does it ever look good. Three simple ingredients, throw in basil and you've got something special. Haven't had a BLT in ages, good meal on a hot day. Looks great and reminds me that I have a pound of bacon in the fridge. I will have to try it with basil (or pesto). I love mine with a couple slices of avocado...a BLAT! THis will be my ultimate BBLT sandwich, great idea! When you have tomato and basil together, you just can't go wrong. No matter how you slice it! yum, the addition of basil sounds great! I've had Avacado Sandwiches before and they're delicious with a little bit of mustard...yummy! Ive, that purple basil is called Purple Basil....LOL!!! It has a little bit stronger taste then the more common basil but then you get that gorgeous royal purple color to play with. You can also easily steep some in vinegar and you get the most gorgeous reddish purple vinegar!! it's hard to beat a good blt, but adding basil just may do it--nicely done. Hey Olga! You can skip the bacon and just make a basil, lettuce and tomatoe and it's just as good!